Your smile speaks before you even say a word. Let your first impression shine bright! If you often hide your teeth, then let Dr. Kitchen's 30 years of experience give you the confidence to smile again! 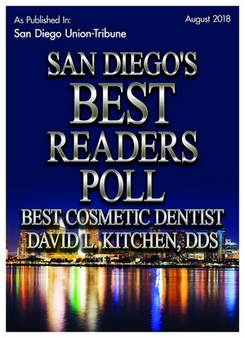 Practicing in La Jolla/San Diego for over 30 years, Dr. Kitchen emphasizes exceptional customer service, individualized attention and welcomes new patients as well as current patients, for all dental services including dental emergencies. Our patients become family and are treated with personalized attention. We use only the best labs and highest quality dental products for all treatments, including restorations. These modern and most up-to-date technologies aide Dr. Kitchen in producing extraordinary smiles making our patients visits, care and experience, superior. Continuing education in dentistry is what keeps Dr. Kitchen consistent in providing modern care. Please read through our website as it contains information about all dental procedures, patient education, and patient information including everything from How to Read X-Rays, Development of the Teeth from Age 6, Cosmetic Dentistry, Tips For Parents and Root Canals to name a few. Please browse through our website and be sure to give us a call if you have any questions or would like to schedule an appointment; you can view our office hours here.